This software can use "32bit Codec" from a "64bit Application". It is a characteristic that the compatibility of the result to be provided is very high to use original 32bit codec. 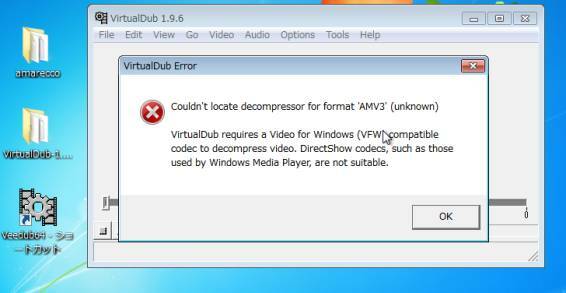 "VirtualDub AMD64" load video file at AMV3 Codec(32bit). Do not install "Proxy Codec64", cannot load it. Install "Proxy Codec64" and Setup AMV3 Codec. And can compress with AMV3 Codec. AMV Codec is already set. Other codec chooses it among a combo box. Input into FourCC a "hfyu", and dll path is at drag&drop from Explorer. Succeed if added to a Codec List. and choose the list and push the About button, and please confirm it. It is added to a combo box. 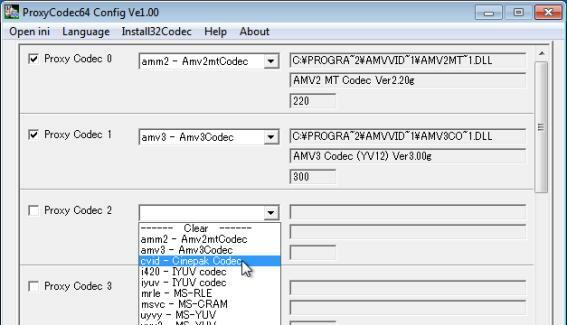 As for the 32bit codec that an original installer is not usable, there is the case that comes to be usable in the same way. Freeze when show a dialog.